— The Crystal Ball has new ratings in the Pennsylvania and Wisconsin U.S. Senate contests, both in Democrats’ direction. In Pennsylvania, Sen. Bob Casey’s (D) reelection bid moves from Likely Democratic to Safe Democratic, while in Wisconsin, Sen. Tammy Baldwin’s (D) race goes from Leans Democratic to Likely Democratic. — Overall, we now rate 49 Senate seats as at least leaning toward the GOP, 44 as at least leaning toward the Democrats (and the two independents who caucus with them), and seven seats as Toss-ups. Republicans remain favorites to hold the Senate after the 2018 election in November, although there is a narrow path for Democrats to take the majority. — Finally, Democrats have a real chance at an upset in one of the Trumpiest districts in the country, WV-3. The Crystal Ball is shifting its rating there from Likely Republican to Leans Republican. In 2016, President Donald Trump narrowly carried Pennsylvania and Wisconsin by a combined 67,000 or so votes to defeat Hillary Clinton and carry the two states’ combined 30 electoral votes. Those victories, along with Trump’s 10,000-vote win in Michigan, seemingly signaled an end to the “Blue Wall” that supposedly gave Democrats a built-in advantage in the Electoral College. Fast-forward 18 months, and Democrats find themselves the beneficiaries of a midterm environment where a Republican incumbent president has an approval rating in the low 40s. While Democrats are defending about three-fourths of the Senate seats up in 2018 and could very well lose net seats in November, the Rust Belt seats that they worried about at the start of the cycle seem to be increasingly out of reach for Republicans. Just last week, the Crystal Ball moved the Ohio race between Sen. Sherrod Brown (D) and Rep. Jim Renacci (R, OH-16) from Leans Democratic to Likely Democratic. Now Sen. Tammy Baldwin (D-WI) is also joining the Likely Democratic category, moving from Leans Democratic. Baldwin spent much of the cycle looking like a top-tier target for the GOP, and along with Sens. Brown of Ohio and Bill Nelson (D-FL), she appeared to be one of the only truly endangered Democratic senators in a state that Barack Obama carried twice. However, the environment in the Badger State appears to be sufficiently favorable for her reelection chances to receive an upgrade. Election results over the past six months in the state suggest that Republicans will have trouble this November. These results scared Gov. Scott Walker (R-WI), too, to the point that the Wisconsin GOP sought a legislative workaround to overcome a court order to hold additional special elections. In a January special election, Democrats won a state senate special election by 10 percentage points in a seat that Trump won by 17 points. Then in a Wisconsin Supreme Court election in April, liberal Rebecca Dallet defeated conservative Michael Screnock in a statewide race by 11.5 points. These results had played a part in the Crystal Ball’s previous Leans Democratic rating for Baldwin, but then the pro-Democratic environment in Wisconsin received further confirmation on June 12, when Democrats captured another state senate seat in Trump territory, winning by three points in a district Trump carried by 18 points in 2016. In four special elections for the Wisconsin state legislature in 2018, Democrats are outperforming Clinton’s district margin in the 2016 election by 20 points, on average. That is, if Clinton lost a district by 17 points, the average Democratic improvement would result in a Democratic victory by three points. To be sure, this is a small sample, but along with the state judicial election, the results seem to warrant the concern expressed by Walker and other Wisconsin Republicans. On top of these election outcomes, Baldwin’s potential GOP opponents are not engendering much confidence from GOP leaders. Senate Majority Leader Mitch McConnell (R-KY) recently made headlines when he did not include Wisconsin and other purported Republican Senate targets on a list of key contests that he thought would determine control of the Senate. The GOP primary in Wisconsin appears to be a two-way race between veteran and businessman Kevin Nicholson (R) and state Sen. Leah Vukmir (R). Vukmir received the state party endorsement in the Aug. 14 primary at the GOP’s May convention and has the backing of many Walker allies. Nicholson has caught flak from some Republicans for having been a Democrat, and not just any Democrat — he was president of the College Democrats of America and even spoke at the 2000 Democratic National Convention. But conservative groups like the Club for Growth are backing Nicholson’s candidacy, and he had outraised Vukmir $2.3 million to $1.2 million as of March 31. However, the winner of the Nicholson-Vukmir battle will likely be in a major financial hole against Baldwin, who had $8.1 million in her war chest at of the end of March, almost 10 times Nicholson’s cash on hand ($840,000) and about 13 times Vukmir’s reserves ($640,000). Given the late primary and Baldwin’s large financial edge, it is little wonder that conservative outside groups have already spent $3.1 million against Baldwin to soften her up for the eventual Republican nominee. Still, while Democratic groups have spent $1 million to support Baldwin, Senate Majority PAC — the main Senate Democratic Super PAC — notably did not include Wisconsin in its initial nine-state, $80 million ad reservation. While such reservations can and will change, the lack of bookings may show confidence in Baldwin’s position. On Wednesday, the Marquette University Law School Poll released its latest survey, which found Baldwin comfortably ahead of both Vukmir and Nicholson — 49%-40% and 50%-39%, respectively. This survey reinforced our view that Baldwin is now a stronger bet to win reelection. Meanwhile, we’re keeping Scott Walker’s own bid for a third gubernatorial term rated as Leans Republican. But that’s mainly because of uncertainty over the large Democratic primary field angling to take him on. If that primary produces a credible nominee, Walker could be in a Toss-up race by Labor Day. Walker has won three statewide victories, winning full terms as governor by about six points apiece in 2010 and 2014 and a recall election in 2012 by about seven points. Those clear but close margins suggest that he could be in serious danger in this sort of environment. The Marquette poll showed him leading each of 10 potential opponents but by small margins in some instances. 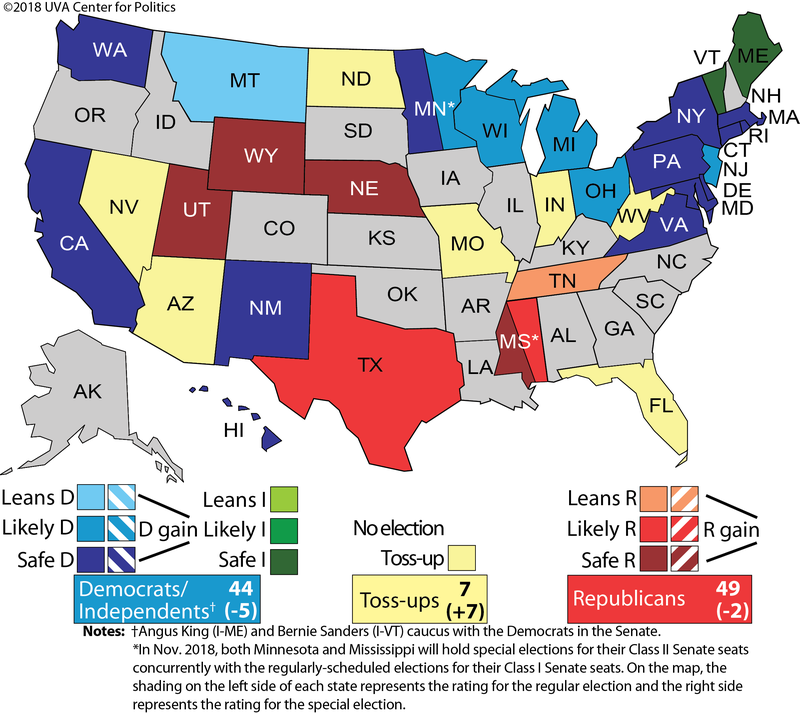 In addition to the new rating in Wisconsin, the Crystal Ball is also shifting its rating in Pennsylvania from Likely Democratic to Safe Democratic, effectively taking the Keystone State off the board. Sen. Bob Casey (D-PA) had double-digit leads over Rep. Lou Barletta (R, old PA-11) in recent nonpartisan polls from both Franklin & Marshall College and Muhlenberg College. Pennsylvania, like Wisconsin, went undeclared by McConnell and Senate Majority PAC in recent listings of competitive races, and Casey too held a lopsided financial edge over his general election opponent as of April 25, with $10.1 million in his war chest to Barletta’s $1.3 million cash on hand. Back in April, the Washington Examiner reported that GOP leaders had “all but written off” Barletta, and they remain frustrated with the Republican nominee. With these two ratings changes, the Crystal Ball now rates five contests as Likely Democratic and 11 races as Safe Democratic. Baldwin joins Sens. Debbie Stabenow (D-MI), Tina Smith (D-MN), Bob Menendez (D-NJ), and the aforementioned Brown in the former category. Overall, we rate 49 seats as at least leaning toward the GOP, 44 as at least leaning toward the Democrats (and the two independents who caucus with them), and seven seats as Toss-ups (five currently held by Democrats and two held by Republicans). Republicans remain favorites to hold the Senate after the 2018 election in November, although there is a narrow path for Democrats to take the majority. We’ve got one other change this week, which is in the House. West Virginia, as noted in this week’s lead piece, is a confounding state politically. Despite voting for Donald Trump by more than 40 points, Democrats still retain a voter registration edge in the state, and the state could very well send Sen. Joe Manchin (D-WV) back to the Senate. Manchin seems likely to carry WV-3, the state’s southernmost district, whether he wins or loses statewide, even though that coal-dominated district also gave Trump his biggest margin of the state’s three districts in 2016. Former Rep. Nick Rahall (D) held this district for decades before losing to Rep. Evan Jenkins (R) in 2014; Jenkins lost the Senate primary in May, thus opening his seat. We flagged WV-3 more than a year ago as a dark horse Democratic target owing to the interesting candidacy of state Sen. Richard Ojeda (D), who has become something of political cult hero in the district and who has attracted national attention. He will face state Del. Carol Miller (R), who won a competitive primary in May. A Monmouth University poll released Wednesday showed a close race — Ojeda was up 43%-41%, with an even bigger lead in the pollster’s likely voter models — and we’re adjusting our rating accordingly, moving the race from Likely Republican to Leans Republican. For all the focus this cycle on Democratic House targets in affluent, well-educated, and traditionally Republican suburbs, the party has some promising targets in places that strongly supported the president but are more open to voting Democratic down the ballot. WV-3 is perhaps the most extreme and unusual example: Trump won the district by 49.2 points in 2016, his 13th-best district in the country according to Daily Kos Elections’ calculations. And yet this district could send a Democrat to Congress.